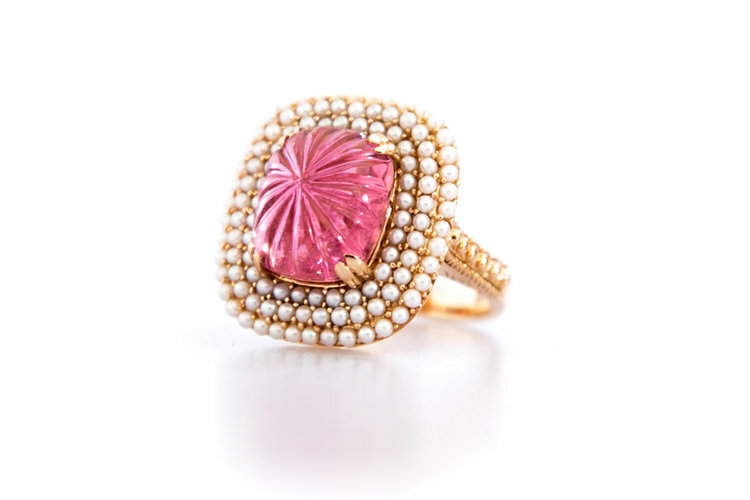 This 18k yellow earring and ring set features florally carved rubellite tourmalines surrounded by halos of pearls. When designing these pieces, Ashley wanted to play off the vintage tourmalines and the delicacy of pearls. The raised gold dot pattern on the band of the ring was designed to echo the texture the pearl halos created. The tourmalines themselves have an interesting backstory: they were chosen by Ashley at the beginning of her career from the vault at Gumps in San Francisco. Gumps has long been known for its incredible one-of-a-kind pieces of art—and this art takes many different forms. This ring and earring set are a true testament to the incredible elegance and artistry that Gumps has always held in high esteem.